Korakuen is famously known as one of the “top three” gardens in Japan, and though it was completely beautiful — even in the rain! — it was raining too hard to get any good photographs of the grounds. 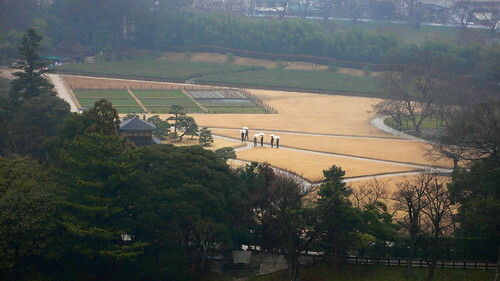 The photgraph above was taken from the top of the main tower of Okayama Castle, which overlooks Korakuen. In the winter, the landscape of Korakuen emphasizes the formal aspects of the garden — the relationships between the masses and tones that inform the experience of the place. You can get some sense of that from the photo above, though as a stroll garden you’re really meant to be in it, uncovering views, which are also intended as insights, as you walk idly through the grounds. In the winter, the grass is an incredible shade of yellow, as if it’s sleeping and dreaming itself. 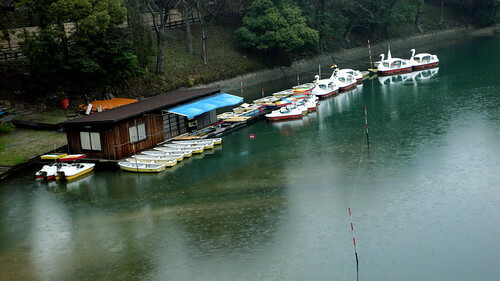 A view of the swan boats from up on the steel truss bridge that connects Okayama Castle to the grounds of Korakuen (which is an island garden). It was raining so hard that the boat landing was entirely closed, but during the busy season the swan boats must be unbelievably popular. 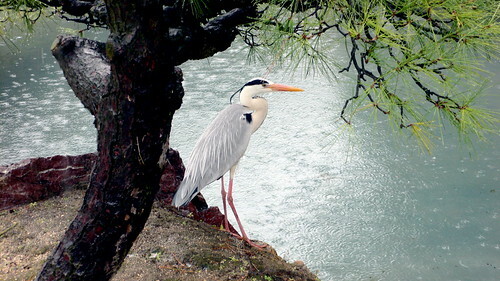 This heron (or is it an egret? I’m always getting them mixed up) was nice enough to stand still for us for just long enough.